As I mentioned last week, I’m on vacation now for two weeks. This week is a staycation and next week we’ll be renting a house on Cape Cod. We’re really looking forward to our week away but there are lots of cool places to visit while staying home, too. 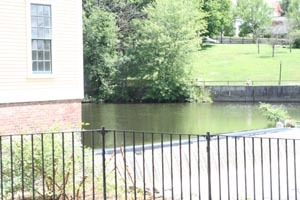 One place we visited was Slater Mill in Pawtucket, RI. Dale took a school group there last winter and he came home raving about it and telling me how much I would enjoy seeing the mills. He was right! The setting is beautiful and even though it was very warm we had blue skies for our visit. The mill is right next to a water supply, of course, so that the machines could be operated by a giant water wheel. 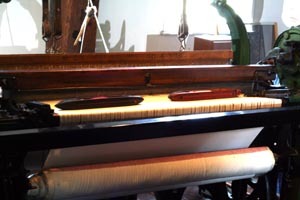 I can’t remember the official names for everything we saw but there were huge looms and carders and electric spinners. 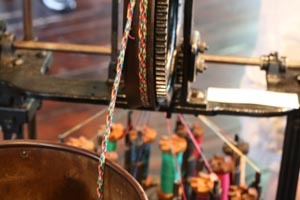 Of course the photos I took of the circular sock machine looked like crap but it was a really neat sock machine that made argyle socks – so cool! 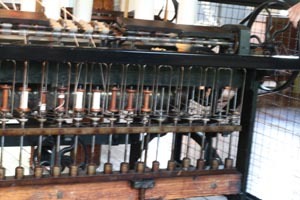 This machine loom fired the shuttles back and forth at a really fast rate. There were instances were children were maimed while operating the machine. And this one makes shoe laces. I love all the colors and watching the braid being created right before our eyes was pretty neat. 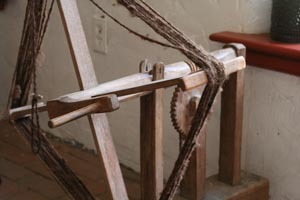 I thought this was just a regular ole skein winder but the interpretor said it’s called a weasel and that the children would wind the yarn onto it while singing “Pop Goes the Weasel” and when the winder was full it made a popping noise and the children would know to stop. Fact or fiction? Slater Mill was a great place to visit and one of those spots we take for granted like Plymouth Plantation or the Freedom Trail. I bet you have historical places right in your backyard, too. You really ought to go visit. Yes, that’s an order. Neat! Singing is a good way to make a boring job more fun. I think the “Pop Goes the Weasel” story could be true. That sounds like a great place! E is training to be a junior docent at a local historic house. While she’s in training, I’ve been helping to transcribe letters. It’s so interesting. And I’ve been meaning to tell you that I’ll be getting to sew some 1850’s style clothing. Fun! 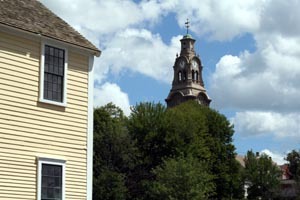 When visiting Salem, MA a few years ago I heard the same story on the Weasel. Slater Mill looks very interesting. That is a pretty cool place. I went for the first time last year. I think it might have been in the fall for some sort of fiber event. If it comes up again I will let you know. It was a small event, but cute. Thanks for the excellent tour! Gotta visit someday. That looks like a fun place to visit! Glad you had a great time. You are so lucky to have such wonderful places in your back yard, Carole. what a fun day trip! I’m still new to Boston so I’ll add it to the list of things to see. Thanks! Looks like it was a fun way to spend the day. It’s just so cool that Dale *knew* you’d love it!! What a great spot to visit. Thanks for sharing it with us! I choose to believe it came from children winding on the “weasel”. I love that story.